What Is Charcoal Made Of? Charcoal burns cleaner and hotter than wood. It contains more energy than wood as well. This is because it consists mostly of carbon; the process of making it involves burning everything else off. 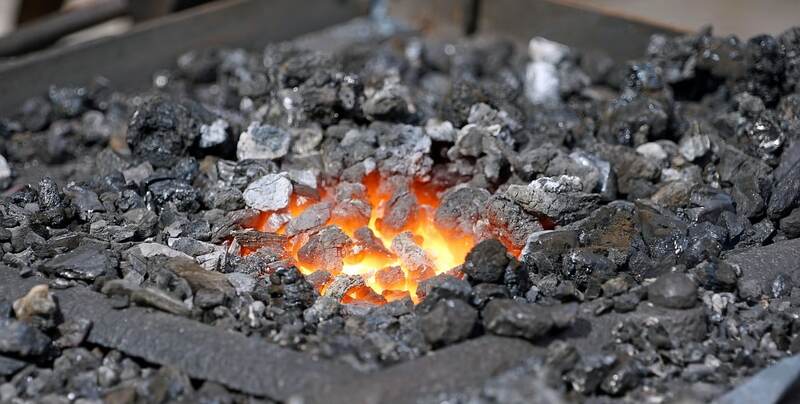 The basic method used to make charcoal is pre historic and there is evidence that charcoal was being used to fuel blast furnaces as far back as 6000 years ago. What is charcoal made from? How is charcoal made? These and other questions answered below. In order to dry the wood and to burn away its volatile components, it is charred slowly. For millennia, this was done in kilns made by heaping dirt into cone shaped piles. The piles would have air intakes at the base and a chimney at the point of the cone. The wood would burn slowly and the fire would be smothered when the wood was sufficiently charred. There are several different types of charcoal, and each is made with a variation of the same process. As the name indicates, this type of charcoal is made from hardwood. The hardwood used to make it can encompass everything from scrap lumber to branches and types of wood. The pieces of wood used to make lump charcoal usually vary in size, which means that the resulting charcoal pieces will also vary in size. The wood is burned slowly in a low-oxygen environment inside large concrete or steel kilns. The fire is extinguished just before the charcoal is burned to ashes. The process can take days. Lump charcoal produces little ash since it consists of dried and carbonized wood. This is different to briquettes that produce a lot of ash because they contain binders and other ingredients. Because hardwood lump charcoal is made from wood and nothing else, it burns in less time and puts out more heat when compared to an equivalent weight in briquettes. Briquettes are uniform pieces of charcoal that have some similarities to lump charcoal, but also quite a few differences. While Henry Ford did not invent the briquette, he made it popular using scraps of wood left over from making cars. Instead of the wood pieces used to make lump charcoal, the raw material for briquettes is sawdust. The sawdust is dried and then charred in what are called retort kilns and after that, they are mixed with a variety of other ingredients. Those ingredients include anthracite coal, mineral charcoal and starch. The additional ingredients serve as binders, make the charcoal easier to ignite and helps it to burn steadily. They are then molded into the distinctive briquette shape and packaged for sale. Binchotan is a variety of lump charcoal made from Ubame oak. Binchotan is different from regular lump charcoal not only because it is much more expensive, but because of how long it burns. The same concepts used in the manufacture of all lump charcoal are used to make binchotan, but they are implemented differently. The kilns used to make it are made from a special clay and can reach temperatures close to 2,000 degrees Fahrenheit. The wood is fired at these high temperatures then extracted and smothered to cool it. Binchotan charcoal is expensive because it is produced in very small quantities and is in high demand because of its quality. BBQ comes in many flavors, but they are all fiery - whether spiced, smoked, charred, or grilled. Fiery Flavors breaks down BBQ - the ingredients, the choices, the techniques - to explore the nuances behind the tastes.